Has the Greek problem been solved? From one point of view, it would be easy to give up hope for supranational crisis management that respects the normative foundation of the EU, getting used to minimal compromises between nationalist member states which offer nothing more than a temporary solution to the problems – an outlook which pleases neither refugees who are arriving in Europe, nor European citizens who see the EU as something more valuable and more necessary than a simple forum for international European politics. However, although it is not dispelling all doubts about the EU’s ability to manage the refugee crisis in an ethically adequate way, Tuesday’s decisions on the relocation of refugees among the EU member states marked a change in the style of European crisis management. This becomes clear if one examines both crises closer, comparing their structural causes and management. The starting point of both crises was a lifting of national border controls which can be seen as one of the great achievements of the European Union. In the case of the Eurozone crisis, it meant the allowance for free capital flows. In the case of the current refugee crisis it was the lifting of border controls for people travelling within the territory of the EU. At the same time, the regulation of the side-effects of these important achievements turned out to be lacking, or even self-contradicting, and did not provide for any (foreseeable) exceptional circumstances – e. g. huge numbers of refugees or sovereign debt crises. The Eurozone crisis can be tracked back to the treaties that created the European Monetary Union, and allowed for free capital flows in the Eurozone. By doing so, business and travelling was made much easier for its citizens. But the treaties would not provide any help in the case of a potential default of one of the Euro’s member states. The co-existence of the ‘no-bailout’-clause, the legal irreversibility of the Monetary Union and the dependence of national central banks represented a paradox which could only be solved by a European coordination of economic politics and fiscal discipline. Yet, an economic governance was never put into place, and the construction of the ‘Stability and Growth Pact’, which was meant to avoid unsustainable public deficits, widely reflected the interests of Germany and other North European countries. They sought for a European ‘Stabilitätsunion’ (union of stability) with national responsibility for sovereign debt – a price to pay for national control of fiscal and economic politics. As if this self-contradicting regulation was not enough, in 2005 Germany and France decided that the deficit margin allowed by the treaties should not be seen as too binding (for them). These structural insufficiencies, accompanied by diverging economic and wage politics, allowed for great imbalances of economic competitiveness. Furthermore, they lacked both the possibility of adjustment on a national level, and of correction on a European level. Thus, it simply did not provide any means to fight a sovereign debt crisis in the Monetary Union. In the meantime, free capital flows built up ever higher current account surpluses in Germany and ever higher deficits in other countries such as Spain, Italy, Portugal, and France. In the case of Greece, these imbalances were exacerbated by a lacking political system. Asylum applicants in Europe between 1 January and 30 June 2015. The sizes of the bars indicate the number of asylum seekers per country. The colors indicate the percentage of asylum seekers in relation to the whole population. The Dublin Agreement shows some similarites to the structures of the ‘no-bailout’-clause in the Monetary Union: Its first version was passed in 1990 and it was meant to regulate side-effects of the Schengen agreement that raised border controls between member states of the European Union, thereby facilitating travel for all European citizens who regularly cross national borders as part of their everyday business or simply for leisure. The most recent version of the Dublin Agreement (Dublin III) does so by setting rules for applications for political asylum in the Schengen-area. According to this agreement, the requests of asylum seekers in the EU have to be processed in the country through which the person entered the European territory, and asylum applicants can be sent back to those countries if picked up elsewhere in the EU. For some European countries this means that they must deal with the largest proportion of asylum seekers because they lie on the routes most used by refugees (Hungary for the Balkan-route and Italy and Greece for the Mediterranean Route). The northern European countries, in contrast, have to deal with very small numbers of asylum seekers, especially if compared in terms of economic power and population. In the case of Germany, this discrepancy becomes the most obvious. Measured by population and GDP, Germany is the strongest and biggest country in the EU. However, since it is surrounded by other member states, the only way for asylum seekers to apply in Germany is to reach the country by plane or via the Baltic sea – an uncommon route for people from Syria, Iraq, Eritrea or Libya fleeing dictatorship, war and poverty. In a nutshell, Dublin III legally frees Germany from dealing with any number of asylum seekers despite its economic and political weight in the EU. Greece and Hungary, on the other hand, have to deal with a much bigger share of the asylum applicants, although they are already pushed hard by political and economic crisis, or governed by dubious nationalist politicians whose commitment to liberal values such as the principle of political asylum is – to put it mildly – questionable. This legislation was never practicable and set the precondition for the current humanitarian situation, because it simply did not provide for a global refugee crisis, even though civil wars in parts of northern and central Africa, Syria and Iraq offer plenty of reasons to flee. When the predictable problems became reality, and made the inadequate structure of the regulations obvious, the first reactions by EU member states were reserved. Since 2010, when the necessity for common European action to manage the Eurozone crisis could no longer be denied, the northern EU states have insisted that the problems are caused by national mismanagement. The much needed European economic and fiscal coordination – advocated by France and southern European states (Portugal, Spain, Greece, Italy) – was denied by northern member states such as Germany, Finland and the Netherlands. In the case of Greece, the German chancellor waited until the very last moment to commit herself to a European management of the Greek fiscal problems. This national ignorance abandoned ideas for permanent and genuine European solutions of the current and future crises, leading to the implementation of a crisis resolution mechanism that deals with such problems on an ad hoc basis and is activated by unanimity among the member states of the Monetary Union. The most “European” crisis management in the Eurozone crisis came from the European Central Bank, which used politics of quantitative easing to Europeanise a fair amount of the Greek default risk. It did so due to its independence from national governments. Thereby it was able to ignore protest from German central bankers. In contrast, the history of the negotiations on the first, second and third Greek bail-out-packages gives a good example of insufficient crisis management by national states(wo)men, as they were accompanied by threats to force a Grexit and are widely seen as inadequate measures which buy more time instead of solving the problem. A real European solution would require more centralized competences, more money for the European Commission and the European Parliament, and, thereby, more democratic legitimacy than the actions of the independent Central Bank and short-sighted agreements of the Euro heads of state. Until this week’s summit of the European Ministers of the Interior, the refugee crisis took a very similar trajectory. Although the terrible situations in Syria, parts of Iraq and Libya – to mention a few – were well known to the European member states, none of them provided enough help to mitigate the problems in situ nor did they prepare the European Union for the possible side-effects of those crises. In fact, Dublin-III was agreed upon in June 2013, and thus in full knowledge of the problems that could cause great refugee movements towards Europe. And here too, de facto Europeanisation came through non-coordinated action as the overstrained European border-states illegally allowed unregistered refugees to travel to other European countries to request asylum – a procedure for which they were criticized by Germany and other northern member states who favoured deterrent over aid. The willingness to find a European solution for the management of the refugee crisis was further put into question by the recent reintroduction of border controls in the Schengen area and the reinforcement of national borders by some east European countries – with Hungary as the worst example. …or a reassurance of Europe’s normative foundation? 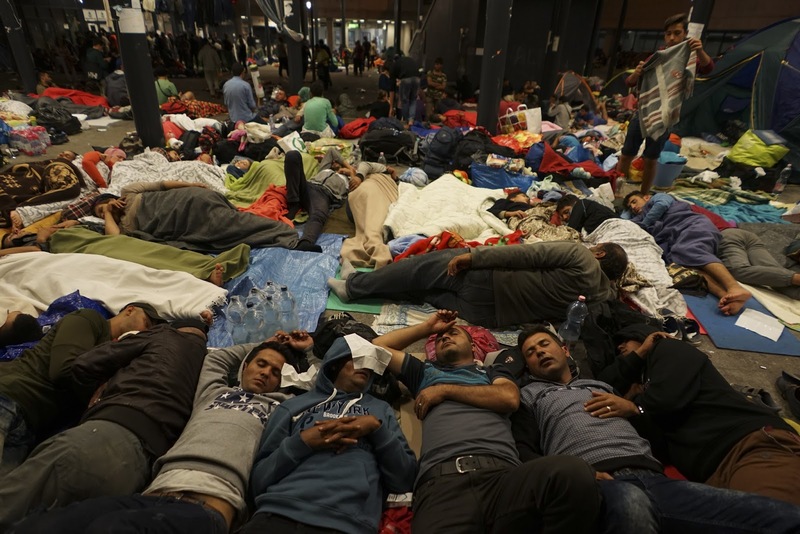 Yet, since the first days of September, when thousands of refugees were stuck at Budapest central station, outpacing the willingness and capacity of the Hungarian authorities to obey the Dublin-rules, the already obvious insufficiency of the Dublin-Agreement became non-negligible. In this situation, change came with the German chancellor, Angela Merkel, who embraced the German responsibility to contribute to the European management of the refugee crisis by letting migrants travel to Germany, and assuring the German public and the refugees that this would not impose any unsolvable problem to the German administration. Unlike her reluctance towards European solutions during the Eurozone crisis, she now sought to convince the French President François Hollande and other heads of state to find a European solution to the refugee crisis. By doing so, she supported the proposals of the European Commission and the European Parliament, who favoured a European relocation of refugees according to a fixed quota. The strong commitment to a European solution by the German chancellor represents a fundamental deviation from the ‘minimal international consensus’-principle that leads the resolution of the Eurozone crisis. This finally became obvious on Tuesday when Europe’s Ministers of the Interior – under the leadership of Germany and France – chose the rarely taken path of a majority decision to impose the relocation of 120.000 refugees to all EU member states, thereby outvoting the nationalist argumentation of Hungary, the Czech Republic, Slovakia and Romania. To be fair, the sister party of Angela Merkel’s Christian Democratic Union – the Christian Social Union in Bavaria – soon showed its disapproval of sharing the administrative and, as they argue, cultural burden with other EU-states. This represents a conflict in the governing coalition yet to be solved. And it also remains to be seen what exactly the German Minister of the Interior will do as he seeks to make the asylum legislation both less attractive to refugees and more efficient. Finally, there are reasons to expect that the rare way of making European politics by majority vote might impose tensions between member states. But Tuesday’s decision was also self-reassuring for the European Union, which was thought to overcome the problems of nationalism that lead to a great European refugee crisis seventy years ago and to build a new union that defends universal, democratic and liberal values. By showing that a nationalistic minority will not be permitted to undermine these principles, the European governments gave new spirit to this normative foundation of the EU. And they raise hope for a truly European management of the refugee crisis that feels more obliged to its liberal values than to the principle of unanimity among member states. It remains true that the blocking minority held by the four biggest member states (France, Germany, Italy and the United Kingdom) in the Council of the European Union still limits the possible autonomy of European politics with regard to national interests, and it is thus obvious that Tuesday’s vote would not have been possible without the votes of those states and presumably the leadership of Angela Merkel. Yet, at least this time it could be for the better. 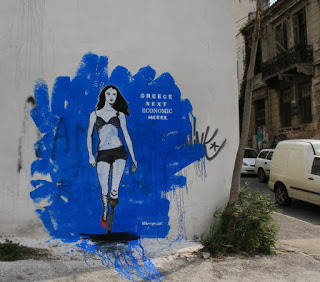 ‘Greece next economic model‘ by Villiamcurtis, licensed under the Creative Commons Attribution-Share Alike 3.0 Unported license, via Wikimedia Commons. ‘Syrian refugees having rest at the floor of Keleti railway station‘ by Mstyslav Chernov, licensed under the Creative Commons Attribution-Share Alike 4.0 International license, via Wikimedia Commons. 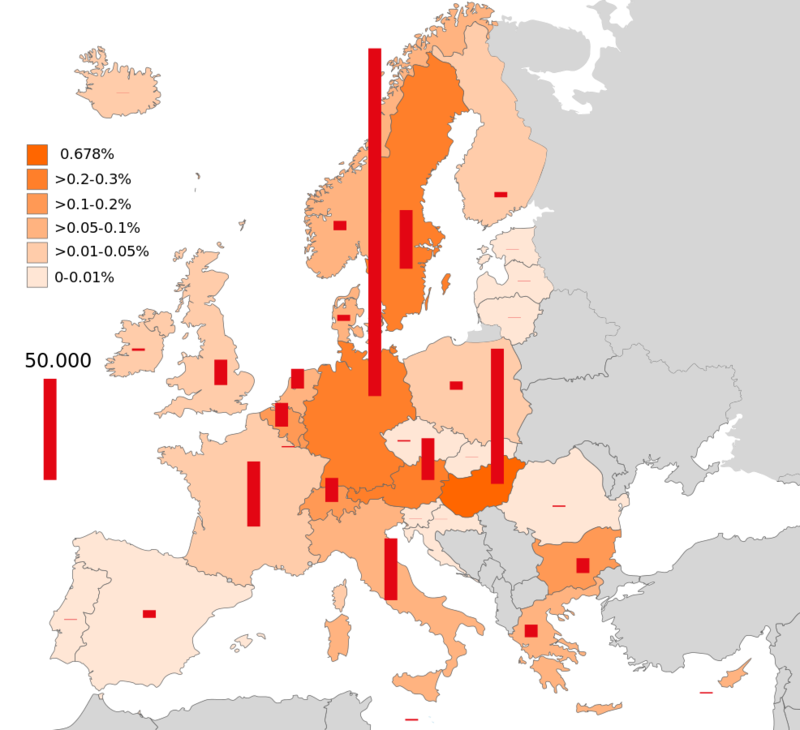 ‘Refugee crisis in Europe Q1 and Q2 2015‘ by Furfur, licensed under the Creative Commons Attribution-Share Alike 4.0 International license, via Wikimedia Commons.